3.1 – Are you a trader or investor or both? Identifying yourself as a trader or an investor is the first step to file your income tax returns. “If you buy shares with the intent of earning income through dividends you are an investor, and if you buy and sell shares with the intent to profit, you are a trader”:). Yes, that is how vague it is, and this is a circular dated 2007, released after 18 years of the original circular. Numerous judicial pronouncements and government was still unable to clear this highly debatable issue. Thanks to the vagueness of this circular, it has given too much power in the hands of the assessing Income tax officer (AO) especially considering the fact that most of the stock purchases are done intending to profit from the price appreciation. Finally the income tax department has brought in clarity in classifying yourself as a trader or an investor (equity delivery trades) through this CBDT circular. It now says that an individual can decide on his own to either show his stock investments as capital gains or as a business income (trading) irrespective of the period of holding the listed shares and securities. Whatever is the stance once taken, the taxpayer will have to continue with the same in the subsequent years. So before filing income tax returns, you will have to first classify yourself as an investor, trader, or both. We will in this chapter help you figure this out in line with what most AO’s would be expecting. By income I mean both profits and losses. Let us understand what each of these mean. Assume you buy stocks or Mutual Funds today for Rs.50,000/- and sell the same after 365 days at Rs.55,000/-, then the profit or gain of Rs.5,000/- is considered as Long term capital gain. Generally speaking, gain or profit earned by investing into stocks or equity mutual funds, and selling after 1 year from date of purchase can be categorized under LTCG. Currently in India any gains realized and categorized as LTCG (equity & equity MF) is completely exempt from taxes for the first Rs 1lk and at 10% if LTCG for the year exceeds Rs 1lk (from FY 2018/19). Do note – the purchase and sale of shares has to be conducted via a recognized exchange. Until FY 2017/18 – if you had bought Infosys shares worth Rs.1,00,000/- 10 years ago, and sold the same today for Rs 1 crore, you don’t have to pay any taxes on your gain or profit of Rs 99,00,000. So, taxes on long term capital gain of Rs 99,00,000 = 0 (Zero) or would have been exempt. Going forward, LTCG exceeding Rs 1lk will be taxed at 10%. To ensure that this tax is applied only from the date of announcement of this tax (Union Budget, Feb 1st 2018), a grandfather clause was introduced – for all stocks held before Feb 1st, the acquisition cost for the purpose of computing capital gains will be the higher of the actual purchase price or the maximum traded price on Jan. 31. Assume you buy listed stocks or equity oriented mutual funds today for Rs.50,000/- and sell the same within the period of 12 months, say at Rs.55,000/-, then the profit or gain of Rs.5,000/- is taxed as a Short term capital gain(STCG) . Generally speaking, gain or profit earned by investing into stocks or equity mutual funds holding for more than 1 day (also called delivery based) and selling them within 12 months from date of purchase can be categorized under STCG. Currently tax on STCG in India is flat 15% on the gain or profit from sale of shares or equity oriented mutual fund. Therefore, if you buy Infosys shares worth Rs 100,000/- today and sell the same 10 days later for Rs.120,000/-, then you are liable to pay 15% on Rs 20,000 (STCG) or Rs 3000/- as taxes. So, tax on short term capital gain = flat 15% of the gain/profit (listed stocks). As per section 43(5) of the Income Tax Act, 1961, profits earned by trading equity or stocks for intraday or non-delivery is categorized under speculative business income. Currency trading is also considered as speculative since there is no STT (unless you are using currency derivatives to hedge). There is no fixed rate like capital gains tax rate when you have a business income. If you have a business income, it has to be added to the rest of your other income and tax has to be paid as per the tax slab you fall in. For example, assume for the financial year my profit from trading intraday stocks was Rs. 100,000/-, and my salary for the year was Rs.400,000/-. So my total income for the year is Rs 5,00,000, and I have to pay taxes on this as per my tax slab, Rs 25000 in this case as shown below. So the point here is that, one needs to club the speculative business income with other income source and identify the taxable amount. Once this is done, tax has to be paid based on the tax slab one belongs to. Income from trading futures & options on recognized exchanges (equity, commodity) is categorized under non-speculative business income as per section 43(5) of the Income Tax Act, 1961. Like discussed earlier, business income has no fixed tax rate, you are required to add the non- speculative business income to all your other income, and pay taxes according to the slab applicable to you. Effectively the business man here is paying 30% of his F&O profits as taxes. You would be wondering why trading equity intraday is considered ‘speculative’ but trading F&O is considered ‘non speculative’? When trading intraday there is no intention of taking delivery, and hence it is considered speculative business. F&O is defined as non-speculative by the government, maybe as they can be used for hedging and also for taking/giving delivery of the underlying contract (even though currently equity and currency derivatives in India are all cash settled, but by definition they give rise to giving/taking delivery. Certain commodity F&O contracts like gold have delivery option to it). Low tax – If the total income (trading + any other) is less than Rs.250,000/-, then there is no tax implication and if less than Rs.500,000/- effectively one has to pay less than 5% of income as tax. Claim expense – One can claim benefit of all expenses incurred for the business of trading (while for capital gains only charges on your contract note other than STT can be claimed). For example, brokerage charges, STT, other statutory taxes while trading, internet, phone, newspapers, depreciation of computers and electronics, research reports, books, advisory, etc. Offset the loss with gains – If one incurs any non-speculative F&O trading loss, this can be set-off against any income other than salary. For example, if I incur Rs 5,00,000 loss in trading F&O and my other income (like rent & interest, excluding salary) is Rs 10,00,000 , I will have to now pay tax only on Rs 5,00,000. Carry forward the F&O loss – If there is net loss any year (non-speculative F&O + any income other than salary), and if income tax returns are filed before due date, loss can be carried forward for the next 8 years. During the next 8 years, this loss can be set-off against any other business gain (non-speculative business income).For example, if you had net loss of Rs 5,00,000 this year trading F&O which was declared on time, you can carry forward this loss next year and assuming you made a profit of Rs 20,00,000 next year, you can set-off the previous year’s Rs 5,00,000 loss and pay taxes only on Rs 15,00,000. Carry forward your intraday equity loss – Any speculative or intraday equity trading loss can be set-off only against any other speculative gain (note: you cannot set-off intraday equity trading loss which is considered speculative with F&O trading which is considered non-speculative). Speculative losses can be carried forward for 4 years if the returns are filed on time.So assume an equity intraday trader makes a loss of Rs.100,000/- this year, he cannot off set this against any other business income. However, he can carry it forward to the next year (upto 4 years). Assume the next year he makes a profit of Rs.50,000/- by trading equity intraday, then in that case he can use the previous year’s Rs.100,000/- loss to offset the complete gains of this year (Rs.50,000). The balance loss of Rs.50,000/- can still be carried forward to the next 3 years. So do note, partial offset of losses is possible. 3.3 – What are you? Trader, Investor, or Both? Trader: anyone who buys and sells with the intention of profiting from the price rise. As an investor, you can claim all your delivery based equity gains/profit to be capital gains. But as a trader, it becomes your business income which has its own pros and cons as discussed above. The rule is very clear with respect to F&O trading, and intraday equity trading. F&O trading has to be considered as a non-speculative business, and intraday equity as a speculative business. So if you trade these instruments, you have to use ITR 3 for filing IT returns. So even if you are salaried, you have to compulsorily use ITR3 and declare this income (profit or loss) from trading as a business. Unlike what most people think, losses also is recommended to be declared. Hiding trading activity on the exchange from the IT department could mean trouble, especially in case of any IT scrutiny (IT scrutiny is when the assessing income tax officer (AO) demands you to meet him and give an explanation on your IT returns). The chances of getting a call for scrutiny is higher when the IT department systems/algorithms pick up trading activity on your PAN, but the same not declared on your ITR. For equity delivery based investments, if you are holding stocks for more than a year, you would have received some kind of dividend and even if you didn’t, you can show them all as investments and claim exemption under the long term capital gain. If you are buying and selling stocks frequently (yes it is an open statement, but there is no rule which quantifies ‘frequent’) for shorter terms, it is best to declare that as non-speculative business income instead of STCG. Another thing to keep in mind is that if investing/trading on the markets is your only source of income, and even if your trading activity is moderate, it is best to classify income from all your equity trades as a business income instead of capital gains. On the other hand, if you are salaried or have some other business as your primary source of business, it becomes easier to show your equity trades as capital gains even if the frequency is slightly higher. Thankfully one thing that the circular clarified was that you can be a trader and investor both at the same time. So you can have stocks meant as investment for long term, and stocks meant for shorter term trades. Just because you indulge in a lot of shorter term trades, wouldn’t necessarily convert all your longer term holdings or investments into trades and therefore bring those long term gains under business income. But it is important to clearly demarcate your trading and investment portfolio while filing returns. Similarly, if you are trading F&O or intraday equity trading, you compulsorily have to classify yourself as a trader, but you can still show your long term investments under the capital gains head to get the benefit of LTCG being exempt from taxes. So, you can be an investor, trader, or both, but make sure to keep the above points in mind, and do consult a chartered accountant before filing returns. Even though this might seem confusing, rules are made for 1% of the population that is trying to break them. As long as your intent is right, you know the basic concerns of the IT department and keep those in mind while filing IT returns, it is quite simple. But stay consistent with the way you classify yourself, don’t keep switching between being an investor or trader to declare your equity short term trades. If you follow these simple rules, let me assure you – there is no need to fear the taxman. Before we wrap this chapter, here are some interesting links that you should read through. CBDT circular on distinction between trades and investments. Business Standard – Is your return from stocks capital gains or business income? Economic Times – Are you a stock trader or an investor? Taxguru – Income from share trading – Business or capital gain? Disclaimer – Do consult a chartered accountant (CA) before filing your returns. The content above is in the context of taxation for retail individual investors/traders only. Since my income was not taxable last year, I didn’t file returns. I’ll be filing returns first time this year. My question is Can I offsets gains in this year against the loss from last year, since I had not declared it last year? Vishal, to carry forward loss it has to be filed within the due dates. So no, you cannot offset. Is it possible to file belated returns now. Yes you can file belated returns which is advisable, but you can’t carry forward that loss. I have a similar question but bit different, I have filed the returns ontime with salary income details but have not disclosed trading losses for last 3-4 years, can I revise / rectify the returns now for those last 3-4 years and carry forward the losses to offset? Sri, you can revise last two years, and since you have filed on time, so yeah you can declare the loss in the revised return and carry forward. Hi,first let me appreciate for detailed explanations provided in this article.i request you to put a snap shot of filled ITR forms for an investor,trader and both.i personally invest in delivery based equity and few i hold for more than a year and most i do positional trades plus investing in markets is my only source of income.Thanks in Advance. my total income (salary+trading) profits less than 250000/ .it means I have no need to file tax return. No need to file, but it is best you do. Will help you in the future to have income tax returns when applying for loans or any kind of credit. sir, I have the same question and got answer on your reply. I have a very little knowledge about taxation…thats why I want to know if I dont need to file ITR, then what do you want to say by “best you do”?? The issue is, income tax department gets access from exchanges on all trades done. They have softwares that pickup people who have traded but not declared it on the ITR. They don’t get to know if any tax was evaded or not. So there is a chance of getting notice, asking why you haven’t declared. Would you help me in understanding if I can put Short term Equity-Delivery gains under the Capital gains head and Intraday+FnO under Business income while filing ITR4. Many Thanks. Yep, that is the right way Vivek. Intraday equity trading has to be under speculative business income and F&O as a normal business income, but yes both under business income. This means Vivek has to declare himself as both trader as well as investor? or Just declaring trader will do ? As soon as you do this – use ITR3 to show F&O trading as business and equity investing as capital gains, you are declaring as if you are both trader and investor. A Great initiative and an excellent tutorial. Thanks a ton for this. I love Pi by the way and I am much profitable trading options for this financial year with Pi. I have a question on carry forward loss. My question is, what will be the carry forward loss in the above case? Will it be the net of 1, 2 and 3 above whice is Rs. 23,500 OR will it be the full amount of Rs. 211,000? Dividend from shares is anyways exempt from taxes. Thank you so much Nithin, that was really very helpful. what does off-market transaction mean? And what is meant by listed and non listed stocks? Pearl, when you open a demat account, you also get something called a delivery instruction booklet (very similar to your cheque book that you get for a bank account). Similar to how you can transfer money using cheque book, you can transfer shares using this DIS (delivery instruction slips). This happens off the exchange, as no trade is recorded on the exchange. Hence called off-market transaction. Non-listed stocks are basically private companies which don’t trade on the stock exchanges. Thank You Sir for your wonderful effort. If I buy shares and sell with in 4-6 months ,can I show this as non-speculative business income? Dheeraj, if you are not actively trading i.e buying and selling after 4 months, you can show it as short term capital gain. Business income only if you are doing this actively. If i am buying/selling and hold time of shares is b/w 1-2 months… can i define this under STCG or business income ?? Sir I am a army soldier and I involved in equity trading in all segment which ITR form should I use for financial year 2017-18,and if I fill Itr 1 for 2015-16,and and2016-17,how It can be revised by itr4 for showing future and options trading P/L. You can revise the returns. ITR 4. From this year it is ITR3. Hi NIthin, I wish to thanks a lot for this wonderful effort. Good explanation about the market related taxation. And one doubt for me. If i trade (speculation & non-speculation) and Short term Gain/Profit though the buy & sell of stocks. then, i re-investment the whole amount (include my gain) and get profit again and so on. Should i pay the gain income tax. or The capital gain tax exempt like real estate short term reinvestment concept. Saravana, Doesn’t work like real estate, you have to pay taxes on booked profits. All long term capital gain (stocks held for more than 1 year) is exempt from taxes. Thank you for your instant reply Nithin. “Equity holdings between 1 day to 1 year with low frequency of trades is considered Short term capital gain (STCG), else in case of high frequency of trades it should be considered as non-speculative business income”. One more doubt in the above statement. Equity holdings between 1 day to 1 year trading with Low frequency & High frequency means how many day or duration. Could you please explain the correct days or duration for (Low & High). Saravana, like I have mentioned in the chapter above, there is no such fixed number of trades to consider low or high. But a general rule to follow is that if trading is your primary business, then best to consider it as non-speculative business income. If trading is not your primary source of income, even if number of trades is a little higher, you can still show it under STCG. But best to consult your CA once. Can i take advantage for my loss in equity in all segment for my tex benifit. Yep, do read through all the chapters. Thank you very much for all the informative articles. I have a few questions about filing my taxes. I have just started investing and trading since Feb 2015. The money (Rs 7,00,000) was given to me by my father since he wants me to get involved in trading . He is a Government employee and does not have time to trade himself. I have no other income since I am a student. I have incurred loss worth Rs 90,000. 1. Which ITR form should I use? 2. Should I show the Rs 7,00,000 that I have taken from father as my income or not? Or will it be treated as gift from family? We want to file legitimate returns and are not looking to divert my father’s funds in my name. 3. I have no income. I made a few profitable trades but mostly losses, (net loss = Rs 90,000). Should I show this as Short Term Capital Loss or loss in business. Trading is not my business and in the future we will be making Long term investments only once I get a job. Thank you very much for all the hard work you are doing and the modules in Varsity have been very helpful. Thank you. 1. Explained in the module Tushar, it depends on what you are trading. If you are doing only equity delivery trades than ITR2, otherwise ITR4. 2. 7lks is not your income, it is a gift and hence no tax liability. 3. As I said, if you have done intraday equity or F&O trading, it has to be shown as a business using ITR4. Do read up all the chapters, all details you know already there. Also since your net income for the year is negative for the year, you no mandatory to file returns. But it is preferable. > I AM A SALARIED EMPLOYEE. MY SALARY IS RS. 4,50,000. > I HAD TAKEN A PERSONNEL LOAN OF RS. 5,00,000 LAST YEAR. > I AM DEFINITELY A TRADER NOT AN INVESTOR, AS I ONLY TRADE IN F&O. > I LOST THE AMOUNT DUE TO MY LACK OF KNOWLEDGE IN TRADING. BUT, I DID MAKE PROFITS FEW TIMES WHICH I NEVER MOVED OUT OF MY TRADING ACCOUNT AND BY THE END OF THE YEAR I HAD LOST THE ENTIRE AMOUNT. > THIS HAPPENED LAST YEAR AND I HAD NOT FILED MY RETURNS LAST YEAR. AND I HAVE LOST SOME MONEY THIS YEAR AS WELL. > CAN I DECLARE THE LOSSES OF PREVIOUS YEAR THIS YEAR?? > WILL I BE ABLE TO CARRY FORWARD THE LOSSES OF MY PREVIOUS YEAR TOO IF I DECLARE FOR BOTH THE YEARS?? Karthik, what do you mean by last year. If you are talking April 2014 to March 2015, then yes of course you can declare those losses when filing returns this year. But if you are talking April 2013 to March 2015, you can still file late returns, but you won’t be able to carry forward the loss. April 2015 onwards, you need to file returns only by next september. If you are trading at Zerodha, go to tax P&L, has everything you need. Do check out the other chapters, has everything you need to know about filing returns. Please accept my APOLOGY for the use of CAPS. That was seriously unintentional. Wonderful initiative from you and the team at Zerodha. All the articles and modules have been of great help. Thank you for such thoughtful and helpful content.I have a few questions revolving around carry forward of losses. 1.) I am a trader and had a loss of 4 lacs in F&O. I had filed it in time and since there was no other source of income, it was carried over fully. Next year I made a profit of 1.5 lacs. Now how much is to be the brought forward loss. Is it 4 lacs or is it 2.5 lacs (4-1.5). There is no other income source. 1.5 being non taxable profit, can 4 lacs be carried forward? I understand it is for a maximum of 8 years. 2.) If profit is 3 lacs (which is in taxable bracket), then how much is to be brought forward? Is there an argument that since the full loss cannot be reduced, the 4 continues to be brought forward? 1. You can carry forward only 2.5lks (4-1.5). Yes, you can carry forward for 8 years max. I am a trader & I trade both in F&O & short term equity.I also have long term holding.So do I have to add my LTCG to my income & pay tax accordingly or can I declare it as a LTCG & avail the benefit of 0% tax. Dinkar, like I have mentioned in the post, this is a very grey area. But yes if you are investing activity is not very frequent, you can show all of that under capital gains and get benefit of 0% tax for long term. You can show F&O as business. that mean I can declare myself as a trader & investor at the same time. sir, if i trade in F&o only then suppose if my turnover remains less than a crore and profit over 8% of my turn over but my income is below 2.5lacs and my source of income is only from trading , then will i have to file it return ? 2. if my income is between 2.5 <income<5, then i have to as usual 10% ? Waiting anxiously for your reply sir . 1. Not mandatory to file the return if ur net income is below 2.5lks. But it is best if you did. 2. Yes 10% of your income above 2.5lks if ur income falls between 2.5 to 5. As per the case stated by Mr. Jha, Suppose…..
Now the profit from F&O business should be added to his other income. So his taxable income becomes 8,00,000+2,00,000 = 10,00,000. So his total tax liability should be Rs. 0 + 12,500 + 1,00,000 = 1,12,500, NOT Zero as replied by you. Please clarify where did I go wrong while calculating the tax liability in the above case?? WHat you have calculated is correct as per the current tax slab. Some of these answers are 3 to 4 years old, when the slabs where different. Sir, My query is regarding different Mutual Funds offering Monthly Income Plans, does they remit any proceedings every month may it depend on respective applicable NAV ? one more thing, often they use some terms like 1) direct & 2) SWP, what r these mean, kindly clarify. same stock at a price the very next day and keep that for more than one year to claim long term capital gain. Please Advice, you will be highly appreciated. I HEARD THERE ARE SOME SOFTWARES THAT HELP AUTOMATIC DOWNLOAD OF CONTRACT NOTES AND THE SOFTWARE TAKES CARE OF THE REST. CAN YOU SUGGEST ONE. If you are a Zerodha client, our reporting platform Q already has this feature to generate Tax P&L statements. It means that even if you are investing very actively, you need not be worried about it being considered as a business income. Given the latest circular, can we declare our trading income (less than 12 months) as business income and still have a separate portfolio for for long term holdings and make use of LTCG exemption when we eventually sell them. After the new circular, yes you can. But you need to maintain separate books (tab of expenses) so there is no confusion. In 2014, my income from salary was 3 lac and income from equity trading was RS. 91000. Will I be allowed to file return now? Yes you can file delayed returns. I have a very basic question. I wish to classify myself as both trader and investor. I will show all my F&O and intraday activities as Business income and all equity deliveries as Long/Short term Capital Gains. Is this OK to follow this pattern? Secondly, If I follow the above approach, how can I divide the cumulative expense shown in “Tax P&L” report between Long Term capital gains, Short term capital gains and Business income? After the latest CBDT circular, yes you can. You will need to divide this expense on your own. We are working on a new tax P&L which will do this, but will take some more time. Thanks for very nice info about TAX. ” Brokerage / CTT / STT Total / Service Tax / SEBI charges / Total transaction charge and etc…. ” are 50000. So what could be the state ? How much I have to pay ? 1. If I am trading in F&O using my friend’s account, any tax on the business income will be paid my friend right? 2. What if he want to give me profit share/commission post tax deduction for my perpetual help,will I also need to pay tax on this income generated? Assume that this income to me will run in several lacs per annum. 2. Any money that comes to you either has to be as income or loan. If it is an income, yeah you have to pay taxes as per the IT slabs. But whatever money you get as income, your friend can show that as an expense and hence not have to pay taxes on that. Hi Nitin Sir, is central govt. employee allowed to do intra day trading in shares and if yes then what things to be kept in mind? Check this brochure which is intended to serve as a guide. Provided that nothing in this sub-rule shall apply to occasional investments made through stock brokers or other persons duly authorised and licensed or who have obtained a certificate of registration under the relevant law. Does this apply on a PSU employee?? Is a PSU employee considered as an Govt. employee? Can a PSU employee trade/invest in market???? Best to ask your company. What will happen if a government employee has already done intraday trading due to lack of this information? Hmm.. should be okay as long as he/she hasn’t done any trading based on privilege information. i am Employee in private company and have a salary 7lpa. I have opened trading account in nov-15 , i have invested 6000 RS and started learning trading. Most of trading i have done Intraday and some delivery based also which i kept less than 4 days. I suffer loss in delivery based trading and turnover is 21000 and intraday turnover is 700. I wanted to know do i required to audit and record audit-book as its less than 8% of turnover, which form i have to fill for income tax return and which category is best for me as trader (Business Income), Invester (Capital Gain) or both. Use ITR4, yeah you will need an audit because you have intraday trading where your profit is less than 8% of the turnover. Alternatively, if your intraday trading is very less, instead of showing a loss, declare a profit of 8% of the turnover and get away from need of an audit. So if your intraday turnover is Rs 1lk, show 8% as profit, which Rs 8000. The tax slab you are in, you will need to pay 20% of this as tax, or Rs 1600. This will be cheaper than going for an audit which might cost anywhere between 5k to 15k. Ideal way would be to get an audit done. My short term capital gain turnover is 21270.10 and loss is (-) 1657.50 and intraday turnover is 475.65 with profit is 113.65 which is more than 8%. Can i show (-) 1657.50 under STCG and 113.65 under Business Income so i think i can avoid audit. Nitin, wouldn’t it be wrong as we’re not showing the correct information? What if AO ask us to prove that we did earn a profit instead of a loss as we’re mentioning. The reason I am asking this is because I am also under the same situation at the moment. Your example gave me a hope to avoid the audit. Please assist. Thanks. Iqbal, on a profit you are paying taxes to the government. I don’t think this should be an issue, but do speak to a CA. Pl go through Point No. 4.of the key take aways. The income from the high frequency intraday equity will be considered as speculative income. All intraday equity trading has to be considered as speculative. The 4th point just talks about F&O trading. Sir, I think Yogesh is correct here, you need to change below to speculative business income as you are talking about high frequency of trades (not Futures&Options). If you buy stocks for delivery and sell, since you have taken delivery it is not speculative. It is speculative when you trade without taking delivery. I am salaried person. I have not yet started investing in stocks directly(only in MF). I don’t intend to do Intraday trades. If I do Delivery based and F&O, then all the trades done through Delivery should be considered as Capital Gains(Short and Long term), whereas any F&0 trade has to declared as business income. Am I right..? Only issue would be with STCG, if the frequency is more and holding duration is less, then it should be considered as business income.. Am I right..? Yes all F&O has to be declared as non-speculative business income. If you see the post above, I have given link to an updated CBDT circular from this year. It says that irrespective of how often you do delivery based trades, you can still show it as capital gains if you wish. You can also show as business income, but whatever you show, you have to continue showing it based on the same logic in the future. i was trying various website to clear my doubt about F & O and how to treat it while filing ITR. To file TR 2 or 4 . By reading Zerodha articles my doubt get cleared and also learn other things which has in hence my financial understanding. Thanks a lot for such simple and clear articles. such shares/securities would be treated as its business income”. I understand that the assesse has the option of treading the income as business income but it doesn’t give the choice to the assesse to treat it as Capital gains. Is my understanding correct? The CBDT circular given in this chapter talks about “shares & securities” but in this chapter “stocks or Mutual Funds” is used in many places. Does this mean whatever is written in all these chapters is applicable for mutual Funds also, especially equity Mutual Funds? Yes, applicable to equity mutual funds as well. “It now says that an individual can decide on his own to either show his stock investments as capital gains or as a business income (trading) irrespective of the period of holding the listed shares and securities. Whatever is the stance once taken, the taxpayer will have to continue with the same in the subsequent years”. Does this mean that the individual can decide to show gains from frequent(say twice a week) high volume stock trading as capital gain and maintain that stand in the future? Yep, that is what the circular from CBDT implies. Yes, all expenses while trading can be added as cost of your acquisition while calculating capital gains. I want to know about Margin Intraday Future Trading comes in Speculative or Non-Business Speculative Income.?? All trading in F&O can be Non-speculative business income. I got my answer by reading this Q&A about Intraday F&O trade using Margin amount. But here turnover in trading account becomes too high. What if profits are less than 8% on this speculative business in the trade account? Or is it the actual money transferred to trade account (from bank account), that needs to be counted as Turnover? Can you check the chapter on turnover, I have explained this in detail there. Excellent article. I have a question. Is LTCG not taxable under all circumstances even for AY 2014 15? If I declare myself as a trader/business income person, I don’t have any salary, will my LTCG also become taxable? It depends on how you declare, if you declare it as LTCG, then no tax. If you declare it as non-speculative business, then yeah u need to pay. If I submit ITR 4 , will I be still be able to declare LTCG as non taxable? I don’t have salary income. I have small intraday gains, some STCG gains and huge LTCG for AY 2014 15 ( last assessment year, not filed yet). What is the correct form for me? Intraday gains can be shown only on ITR4. Yes on ITR 4 you can declare capital gains and get exemption on long term capital gains. I am transferred by my company out of India & I am having demat account in which i am trading in F&O and also doing investment in share for short term and long term from my normal savings account but since i am transferred out of India can I continue with my this demat account and do trading in F & O and invest for short term and long term from same normal bank savings account or i will have to open new demat account and do it from my NRO or NRI account. Please advice on my query on my e-mail so that i can keep it for my future reference. What about shares lying in my demat account. E-MAIL ID : [email protected] please reply on this e-mail ID. Paurush, it is best to open a new NRI trading and demat account. Move all the stocks in your resident demat to NRI demat. Everything you need to know about opening a NRI account is here. Dear Nithin, You are blessed. Depth of knowledge combined with simplicity of expression is just great. Makes life simple for many. 1.) I can show this income either as ‘Business’ or ‘STCG’…Right? 2.) And does it mean that I can not change my instance (whether Business or STCG) ever in future once taken? Or can we change this stance after 3-4 years? 3.) What instance would you prefer should I take? 4.) Whatever instance I choose…my LTCG is not disturbed (i.e. I have to pay no tax on this)… Right? Or Equity Intraday and F&O can not come under STCG and compulsorily have to be shown as business income? Basically the main confusion is can I show certain part of my delivery trades as STCG or not? 1. Only equity delivery you have an option to show as either STCG or business. Equity intraday is speculative business, F&O is business compulsorily. 2. You can’t change the stance with similar activity. But if your activity reduces, you should be able to. 3. You will have to decide. 4. If you are showing them as capital gains, yep, doesn’t get disturbed. Zerodha has clearly wiped out my doubts. Thanks a lot. Now, a big confusion is that as I have already filed my return for FY2015-16 and also claimed refund of excess of tax while filing ITR2. Since, I am a trader with salaried income these speculative and non-speculative subject made me to think whether I should refile my tax return under ITR4. Pls Guide me whether I should refile ITR4 (Note: Ihave already filed ITR2). Yes, suggest you to refile using ITR4. I am working in a software company and have a salary 6 LPA as CTC and paid tax of Rs 13000 for FY-2015-16. I have opened Demat & trading account in Sept 2015. My primary aim is to invest for long term. But I have done some short term investments. 1. Do I need to pay any tax for this? 2. Is an auditing required in my case? 3. Which ITR form I have to use for e-filing? 4. My company has filed ITR-1 already for me but not e-verified yet. If in case ITR-1 is not the right one, then can I re-file it? 1. On the net profit (after reducing all charges), you will have to pay 15%. 3. ITR2, you will have to show this as short term capital gains. 4. Yes you can refile. Thanks a lot for your valuable help. Nithin, out of the 8 Short term trades mentioned above, one stock I have purchased in CNC and sold the next day. Will it make any difference in taxation you have mentioned(tax %, ITR ,audit requirement)? I am a newbie in market so little confused. Please help. All I learned from here that to be very successful in life, one must wake up early in the morning as Nithin does. I have filed the returns in time with salary income but didn’t give F&O losses for last 3 years (FY2012-13, FY2013-14, FY2014-15), can I revise / rectify the returns now for those last 3 years and carry forward the losses to offset? Sri, you can revise for FY 14/15, and since you have filed on time, so yeah you can declare the loss in the revised return and carry forward. 1. earlier you had mentioned 2 years, so I was asking, as per this I can do for only one year FY 2014-15 and FY 2015-16 is till open till end of Sep, so only these 2 years I can do? 2. During FY15, I had earned bank interest, now that I will show F&O losses in revision, as per details provided above I can club interest earned in to F&O losses (business income), will I be eligible to get the refund on tax paid on interest income? 1. You can only revise for FY 14/15 and FY 15/16. 2. Yes you can revise and request for a refund. FY 2012-13, FY 2013-14 I have filed ontime with Salary income but didn’t include F&O losses as mentioned earlier, if I rectify / revise for these years, I know I can’t carry forward the losses as you mentioned earlier but can I club bank interest earned during each year with F&O losses (as a business income) and claim for tax refund? Or even refund is not possible coz they are more than 2 years old? Sri, for those years you cannot revise/rectify. There is a deadline upto which you are allowed to rectify/revise. Is a partnership firm/private limited company deriving income from stock market, also allowed to choose to be a trader, investor or both? Or should these entities necessarily declare their income as business income? Partnerships/companies can also show both capital gains and business income. In the above Qs, partnerships/private limited companies or even PSUs should be having flat 30% tax rate on thier busines income (both intraday and F&O) and they should be having 10% tax rate on LTCG (it’s 2018 budget) and 15% on STCG. I look forward for your valuable advice. My query is little long. In FY 2014-15, I had loss about 5 lakhs from indtraday share trading (No delivery of equity share in demat A/C). Other than that my total income (Salary + Bank Interest) is below Rs. 1 lakh. I consulted a CA and he put this under Short Term Capital Loss in ITR4 form to be carry forward. However now I came to know that this must be under speculative loss. Was my ITR filling incorrect ? Does speculative loss require book keeping and auditing? I have received IT notice for Limited Scrutiny for security transactions. How should I deal with it? In the FY 2015-16, I had profit of Rs. 900 from indtraday share trading. Other than that my total income is around Rs. 5 Lakhs. I filled the ITR4 for this year as well but I have not shown this Rs. 900 profit as I am not sure where to add this income and also I have not transferred this profit from my DEMAT account to my bank account. Is this comes under tax liability even if you have not transferred your profit from your DEMAT to bank A/C? Does my this year intraday trading require book keeping and auditing? ITR 4 is correct, but yes it should have been speculative loss. Audit/book keeping requirement is if your turnover is more than 1 crore or profit less than 8% of turnover (check the chapter on turnover). If your turnover was below 1crore, no audit was required in your case in 2014/15. Ideally you should have showed this profit in your ITR4 for 2015/16. It doesn’t matter if you have withdrawn it to your bank or not. You can revise your return even now. Audit requirement is again based on your turnover. Thank you so much for excellent and crisp article, I have one question, I am salaried employee and primary income is salary. I invest for short term and long term delivery based stocks. (1) I bought 100 ITC may 2016 , and 100 FIEM shares in June 2016 and they are in my demat account . (2) On 29th Sept ( Surgical strike by India) I sell 100 ITC and 100 FIEM shares , and after that ( on same day ) market goes down and I bou those shares back again same day. This is treated as day trading on 29th Sept ? or I shall calculate profit as Profit = Purchase price ( as in May/Jine ) – Sale Price on 29th Sept.
and new holding starting on 29th Sept. And these being LTCG / STCG. Thanks for your time , apreciate it. If you sold shares in a fear of price eroding and you bought this back and that too as a one off incident, you can consider this as capital gains itself. If you show this as an intraday trade, you will be required to use ITR4. My friend got loss of 4 lakhs… Is it mandatory to show that loss. He thought it was not required to file ITR. He got scrutiny notice. Ram, go through the entire module, has explanation.Now that you have received notice, you will have to explain to the income tax officer that you didn’t declare because there was no tax to pay and you had a loss. 1. should i need to show loss in ITR even do not want carry or take benefit from future income from same head. 2. what will happen if not show loss in ITR and IT AO can take any action regarding this. I have read mutiple post but anywhere not mention what happen if not shown loss in ITR. Please guide me on quey. I am having taxable income ( salary + trading) less than Rs 2,50,000, I did intraday as well as delivery trading and did not file any ITR. Do i need to? and I intend to classify myself as investor not trader but I have already did many interaday trading from Jan 2016 to Sep 2016 (without any ITR). Do I need to as my income is less than Rs 2,50,000. Neeraj, not mandatory but it is advisable to file your ITR. You will need to use ITR4. Thanks a lot for this elaborate article. I have been for this since some time and most of my doubts have already been clarified here. I have a question on claiming expenses such as (Telephone, Laptop, electricity etc.,). As I am a housewife and all the bills are in my husbands name (because he owns the house) Is it possible to claim those expenses? Or is it mandatory to have in my name to be able to claim it? I am guessing your husband is not already claiming those expenses, if he isn’t you definitely can. As long as you are using them for the business of your trading. Thanks for taking time to respond. Yes, He isnt claiming those expenses. All the bills are directed to him as he owns the place. Correcting typo above: I have been looking* for this since some time and most of my doubts have already been clarified here. First time I have read an article which is so clear and compact about Taxation in Trading. Thank you so much. Just one question. If you are an active trader, trading in equity and futures, both intraday and delivery and your total income is below the taxable income, do you still have to file income tax return. Not mandatory to file, but advisable to. Can I show investment in stocks under 80 c? No. Tax saving mutual funds (ELSS) . Yogesh since these are delivery based trades, they are non-speculative. This is a great article. Thanks for all your help to clarify the rules & the process. I have few basic questions here. 1. I understand that we need to declare ourselves as Investor or Trader or both. In my case it will be both since I have long term investments as well as F&O. But my question is, where do we declare it ? Is it somewhere in my ITR file, or is it somewhere in my profile created under incometax govt site, or is it to be done by my broker ? Please clarify. 2. I am trading through 2 brokers – one is obviously Zerodha, another is ICICIDirect. It is a different topic why I am maintaining 2 different accounts, but here my question is – what is the consequences of a mismatch of my “activity type” in these 2 accounts ? To explain it better: I am doing mostly investment activities in ICICI. And in Zerodha I am doing mostly F&O and few short term trades. So I am an Investor in ICICIDirect and I am a trader in Zerodha. So how do I declare myself (once I know an answer to Qs 1) ? I guess I have to select the option “Both” but is it really available as an option ? Or do I declare myself as Investor in ICICIDirect and as Trader in Zerodha – which will inherently give me a status of “Both” ? Please throw some light how I should classify myself. Of course I want to take the zero tax benefit on my LTCG, so cannot show that as business income. I have always shown that as LTCG in previous years (but I did not do F&O trading earlier). 3. How do we make a swicth.. I mean what is the process ? I know that we should not make a change. But in case I find out that my “declaration” at present is not correct somewhere, I have to change it at least once to rectify it. Is it allowed and what is the process ? 1. There is nothing like declaring. You use an ITR 4 and show all F&O under business income and equity investments under capital gains. 2. Ah, doesn’t matter how many accounts you have. You just just file ITR4 like I mentioned above. Combine all capital gains and show as one on ITR4. 3. There is no status as such to switch, just start using an ITR4 from this year. That’s it. Thanks a lot Nikhil ! Speculative business gains (profits) can be offset with only other speculative gains. My question is there any such source of income( apart from intraday trading) available that will generate speculative gains(profits) or to offset speculative business gains, i need to generate intraday trading profit and then only I can offset. Hmm.. all gambling kind of activities – lottery, horse racing, etc comes under speculative. Have filed returns but not included trades in the last 4 returns filed. would it be possible to file belated returns for all these earlier years? if yes, what is the penalty for late filing. You can revise a return within one year of filing provided it’s filed within due dates. So you can revise only for FY 2015-16. Penalty would essentially mean paying the tax that might have gotten evaded with interest rate. If there is a loss, nothing. Can we offset the losses in F&O partially in the current year, and carry forward part losses to the next year when we believe we can make correct use it based on the slabs. Thanks for clarifying Nithin! Do we have to pay the adjusted amount of tax before 31st March of the current year, or do we get time to do our calculations and pay the adjusted tax along with the last date of filing returns (31st July)? If I have 10Lakhs profit and 9Lakhs as the loss, can I record 7.5L as Profit for the current financial year [after adjusting 2.5L from losses to current financial year] and set off remaining 6.5L loss to next financial year? My CA says as per Section – 72, Income-tax Act, 1961-2016, we can only set off the net loss (supposing we have more loss than profit for a year) to the next financial year! Yes your CA is correct. I have borrowed money from family and friends upto Rs20 lakhs, I have used that money to Trade in the Nifty Options(Intraday), now for about 6 months I have Traded in a discipline way and made about 30%(Rs 6,00,000) returns, I had agreed to share Half of the Profits that I make with the people from who I borrowed the money. 1.) Now Should I pay taxes from my account for all the 6lakhs or should I pay it only for 3lakhs which is 50% of the profit generated. 2.) If I pay Taxes for all the 6 lakhs, which is around Rs 45000, and transfer half of the remaining amount to my lenders (either online or by cheque) will they be exempt from the Taxation for this income, If yes, what forms should I use to show this legally. 1. When you are giving back 3lks, show it as interest you have paid for the loan taken. You will need to pay tax only on the remaining 3lks. 2. They will be exempt from taxes only if they show this as return of their original capital. If they show it as profits/interest earning, they will need to pay taxes. Best to do as in point 1. 3. They can’t show this as trading F&O income, they can show it as interest income. Btw, borrowing/pooling money to trade markets is a grey area in terms of compliance. as an investor, trader, or both. tax on LTCG is at 0%. has to be conducted via a recognized exchange. is taxed as a Short term capital gain(STCG) . and selling them within 12 months from date of purchase can be categorized under STCG. is categorized under speculative business income. and my salary for the year was Rs.400,000/-. as per section 43(5) of the Income Tax Act, 1961.
according to the slab applicable to you. one has to pay less than 10% of income as tax. other than STT can be claimed). and electronics, research reports, books, advisory, etc. this can be set-off against any income other than salary. I will have to now pay tax only on Rs 5,00,000.
and pay taxes only on Rs 15,00,000.
for 4 years if the returns are filed on time. this year, he cannot off set this against any other business income. However, he can carry it forward to the next year (upto 4 years). to offset the complete gains of this year (Rs.50,000). can still be carried forward to the next 3 years. So do note, partial offset of losses is possible. needing help of a CA to file your IT returns. 1. I earned Rs 3,00,000 as income through professional service. 2. I also earned STCG of Rs 5,00,000 . 3. I made loss of Rs 15000 in intraday trading. Total income = 300000+500000-15000 = 785000. Suppose I have deposited 150000 in PPF to save tax. Net taxable income will be =785000-150000= 635000. Now tax is exempted for Rs 2,50000. Total income from professional services and intraday trading = 300000-15000 = 285000. For STCG of Rs 500000 = Net tax payable @ 15% = 75000. Intraday trading is speculative business, so that has to be carried forward, can’t set it off against your professional income or STCG. You can carry forward this intraday loss to next year. How the rest will work is, you reduce 1.5lks (PPF) from your total income 8lks (3+5). You are left with 6.5. In this 6.5, the first 2.5 there is no tax. You are left with 4. So Rs 60000 and Rs 15000 of carry forward intraday loss to next year. But as u stated in chapter tax on STCG will be flat at 15%, so isn’t this should be 15%of 5lkh & tax on 3lkh will be as per tax slab?? It is 15% flat if you are in the 20% tax slab. If your total income is less than 5lks, you get the benefit of paying as per your income tax slab. So if your salary is 2lks and STCG is 1lk, you pay 10% of just 50k. First 2.5lks is tax free and then next 50k is at 10%. If by adding my salary income and STCG my total comes in 30% tax slab, will i still pay flat 15% or something different?? i m waiting for ur reply..
No, you get the benefit of maximum 15% on STCG. If you are in the lower slab, you pay as per your tax slab. I have salary of above 7 lacs and I do invest and hold stocks for long term and occasionally do some short term trades also. 2. Which ITR form I have to use for e-filing? 3. Is an auditing required in my case? If yes, can I show profit of 8% of turnover and pay 15% tax on that to avoid tax audit? 4. Is it required to show my stock purchases that are not sold yet in the tax filing time? 1. No profits, so no tax. 2. ITR 2 (you have intraday, but since it is so little, you can maybe show this as short term itself. Best to speak to a CA). 3. If you use ITR2, no audit. But if you show intraday as speculative business, yeah audit needed. 4. Best to show it. Thank You Nithin for valuable response. I will speak to CA about intraday trades. Just to understand better, audit requirement when profit is below 8% of turnover is only applicable to intraday and F&O trading and not applicable for short term and long term delivery based transactions? Am i right? Yes. Only for business income, not for capital gains. Hii Sir, I am planning to show STCG as Non-speculative business income. Trading is only source of income for me. Zerodha provides me with combined charges for both INTRA-Day and STCG in one excel sheet (TAX P&L Report). If I have to show STCG as a non-speculative business income then how can I separate the charges from the combined one. Please clarify. Thank you. Rajiv, we are working on the new tax P&L which will show this. Until then you will have to manually separate out these charges. I would like to know that whether central government employees are allowed or not to do share trading. I am a central government employee and confused as I am not able to find reliable information. Kindly help me in this regard. My sister had shares worth around 4 lacs in her Demat a/c in BOI….She had bought them around 10 years back. She transferred those shares to my Zerodha Account and I Sold them for her 2 days back, all the 4 lacs worth shares…So now how much tax should I pay for that…Kindly educate on this…Thanks. This can be shown as a gift to you and if your sister had paid STT when she bought the shares 10 years back, there is no tax in your hands as the gain is all long term capital gain. I understand this and I want to apply this for my taxation because I want to show my STCG as Business Income, without impacting the zero tax on my LTCG. But the CA who is working on my case (mine is Audit case, hence I had to take a CA) is of the opinion that I can either show the capital gains as LTCG-STCG, or I have to show both of them as business income. He said, the moment I show the STCG as business income, it will convert the LTCG also into business income. I have told him about your article, and he happens to know you as well. But he categorically mentioned that the concept which you explained is wrong. Now I am in a fix. I have already paid 50% of his fees as advance and I cannot come out without forfeiting my money. Moreover, it is very difficult to find a CA who even understands these terms. At least this CA understands it clearly although he has a different opinion. I have told him about the circular but in vain. Can you please help me how I should handle it ? I do I convince him ? Can you refer any CA who agrees to your concept, and may be I can have my CA speak to that CA. I will have to incur huge tax if my LTCG is shown as business income. On the other hand, I can save good amount of tax if STCG is shown as business income because then I will remain under Rs. 2.5 lakh slab, hence zero tax on short term trades. Sudipta, hmm.. The loophole here is that we can show all stocks held for over 1 year as LTCG to get tax exemption and those lesser where you made a loss as business loss. This essentially is a way to cause a loss to exchequer. I know CA’s who avoid taking this route, but I also know a lot of our clients who do and haven’t had an issue. Deciding on declaring your business as trading or capital gains just to benefit the way you are saying, is not advisable. Best to declare as STCG itself. Btw, if your total income is below 2.5lks, STCG doesn’t apply. You wouldn’t need to pay the 15%. i am government servant, and i do trading since last 10 years, in intraday, deliverybase, marginplus intraday, option trading, when i calculate my purchase price & sell price i have to count all expense related to brokerage with STT or all expense related to brokerage without STT………. i mean when count profit or loss STT is count with brokerage or not? please guide me……..
You need to exclude STT if you are calculating for capital gains (delivery based). For business income, (intraday) you can include. Sir I’m a PSU bank employee and I did intraday trading for about one month and recently I came to know that central government employees can’t do speculative trading that is intraday…kindly guide me whether to stop it or carry on it..
Hmm.. best to double check with your bank directly on if you are allowed or not. Can Intraday trading (Equity) profit be declared as Short Term Capital Gains or do I need to declare it as Speculative Business Income ? It has to be shown as speculative business income. I invest in shares for both long term and do short term trading as well – short term trades are all delivery based. ie I buy shares and hold them for 2-3 months and then sell them.No intraday or F&O activity.Till 2015 I used to do only long term trades and it is only since last year that I have started doing short term trading. Hence I am bit confused on how to show the profit/loss in ITR. I am aware that I need to fill ITR2 based on my trading activity. For short term trades, I kept reinvesting the original amount+profit in the same stock.Eg in stock A,I invested 30000,after 3 months I sold it earning profit of 5000.Then I reinvested the same 35000 again in the same stock and earned 4000 profit.Then third time I reinvested the 39000 in same stock and made profit of 3000.I keep following same pattern for other stocks as well. On the ITR you need to mention total buying value and total selling value. STCG automatically gets calculated. So total buying value : 30+35+39, calculate total selling value similarly. 2. In addition,(this is just for my info) – if I had made a loss of 3000,then this needs to be updated in CFL section – under assessment year 2016-2017? 3. Apart from these 2,is there any other details I need to mention regarding STCG in ITR? 3. Thats all the info. i am a house wife. There is no income other than interest on saving account, FD and capital gains from trading. Last year, the trading was started in Delivery based, Intra day and F&O. If you consider total turnover in F&O, it is 5.96 lacs and a loss of 1.12 lacs, whereas in Intraday, the turnover is 0.81 lacs and a loss of 67K. The turnover in Short term is 13.24 lacs and profit of 0.75 lacs. Considering that I DO NOT have a business set up where I can show expenses on rent or telephone bill or staff etc, what ITR return form should I use to book the loss? If it is ITR3, I do not have balance sheet or profit/loss statement with me as I do not have business set up. It is ITR3. You don’t need to be a business setup to have a balance sheet. It is quite simple for anyone to make a personal balance sheet. Dear Sir, i am a private employee and a regular trader and trades in F&O mostly in zerodha (intraday as well as BTST), i have even done some Short term equity trading, how to proceed with tax filing..which ITR to consider am i required to fill ITR 4 ? or can i go ahead and file returns thru Clear tax website with addition of F&O in same STCG column please guide sir. one more thing wanted to ask volue of trading activity (turnover) would be considered how in case of F&O trades like margins used or whole lot value ? ITR3. Go through all the chapters, I have explained in detail on how to calculate turnover and everything. I am filling my returns for the first time this year, and I’ve been trading since 2014. Since my income was not taxable and turnover was less, I did not file the ITR return. Since trading is the only thing I do, I want to declare trading as Business (and also as investor if possible, for LTCG). Meaning, if I purchase say 100 Reliance shares to do delivery based trading, but if it’s value goes down and I continue holding it for more than 1 year, then can I claim it as long term capital gain later when I sell? Because I bought with intention to trade and it accidently turned into long term holding. Please guide me on this. 2) Shall the Dividends earned on the shares I trade be except from tax completely? Or it will be taxable if I declare trading as business? 1. yes you can have both investments and trades at same time. When I declare trading as business, I do accounting as ; The shares purchase go into Purchase account and shares sold go into sales account. The profit is calculated as Sales-Purchase= Profit. Now, if I buy say 100 X Reliance, I make entry of it in purchase account. But if I have not sold these, at the time of filing return, it will show under Purchase account on left side and Closing stock on right side of the P&L statement of my right? And later if I want to declare it as LTCG if it crosses holding period of 365 days, How will the accounting entry be changed from Purchase account to Investment? This is a very big question bothering me since 2 years. If you can clarify this, It will be a game changer and bit relief. If you are declaring trading as a business, you can’t suddenly tomorrow decide to change it as capital gains. If it is investment you show separately under capital gain. If it is business income, you show the way you are. You can MTM all your equity trades based on March 31st closing price. you can start the next year with closing march 31st price. If capital gains, you show it under capital gain right from the start. I have a query, when you mention that a person can be trader as well as investor same time. Can I declare my equity delivery & MF profit (kept for a year) as LTCG while the other lesser duration holding as business profit? Also, can I show the cost for laptop and internet connection charges as cost? I actually posted a query but seems missing. You need to be consistent at this. Just to show your laptop/internet charges as expense you can’t show your short term gains as business and reduce it. You can show these as expense if business income. Nithin, my intent for considering self a trader in not just to manage cost. Instead, as I left my job for business purpose only and will be starting it. Currently my focus is for short term returns via equity and yes parallel to that I had some MF investment i did for tax saving purpose. I am asking abiut those, if I redeem those now, can I show them as LTCG along with my this year’s profit from trading. As I mentioned that business is what I am pursuing and no salary income, isn’t it better to define self as trader? Also, like you mentioned that for trader gains or profits are taxable as normal tax bracket, instead of fixed 15% on STCG. Yes, mutual funds for sure you can show as capital gains. Yes if you are doing this full time, you can show it as business income. But don’t selectively show certain stocks as capital gains and others as business income. I’ve one question regarding intraday trading in equity. Net purchase value is Rs 261290. Net sales value is Rs 262836. According to your article, Rs 1546 is turnover and 6% of Rs 1546, i.e. Rs 93 is profit from business. But logically isn’t the full amount, i.e. Rs 1546 should be treated as profit from business. Because that’s the money I’ve earned. How can we treat Rs 1546 as turnover that’s very low. Further if any person earns 90 lakhs….He/she would be very happy to offer only 6% as profit. You are talking about section 44AD. Which was made for small businesses who wanted to avoid an audit if turnover wasn’t much. Rs 1546 is the profits and taxes has to be paid by adding that to your income. Yes this is kind of a loophole for a trader to show 6% of turnover as profit and pay tax around it. But taking any such route to avoid paying taxes can be a pain tomorrow, chances of being asked to pay tax with penalty. This is meant for small businesses to avoid audit, as long as it doesn’t cause a loss to the government. Since the turnover is less than 2 crores, everyone will definitely choose section 44AD. No penalty and tax can be levied as there is no breach of any law. And the question still remains unanswered…… What should be the turnover? Turnover is the P&L in case of trading. Do check the chapter on turnover. Can you help me regarding short term capital gain on selling shares . Suppose I bought shares of 1 lac and sold them after 6 months at a profit of 50,000. The amount i will in my account would be after-tax return or do i need to mention that profit at the end of financial year and will be taxed according to the slab? You have to mention that at end of year in your ITR and pay 15% maximum tax on STCG. 1 trade and all shouldn’t be an issue. You will have to file your return using ITR2 to show your equity investments. Tnk u Nithin. As a central gvt employee can i invest in short term and gain income or is it banned for us? Or should invest only in long term alone?? Equity investing for both short and long term is allowed almost everywhere. As long as you don’t have access to some privy information of the stock. I am a long term investor and have stocks worth of 40 lacs in zerodha ac. I am studying trend following treding in futures for more than 3 years and i want to start trading in futures. So can i be both “Investor and Trader”? If i trade in futures can i get benefit of my long term investment in stocks? I would like to be treated as a long-term investor in terms of taxation. Hence I won’t be selling shares before holding them for at least 1 year. Now, I have been accumulating one stock say Infosys for more than 1 year. I got 50 shares which was bought before two years and I have 20 shares that I bought 6 months before. Now if I sell 50 shares alone, would that consider as long-term turnover ? I would hold the remaining 20 shares till it reach 1 year holding period. Can you please confirm whether this would be fine so that I can maintain my status as ‘Long term investor” ? Sahil, everyone in India (even salaried) have to pay 30% tax above 10lks. No way to get around it. But since you show this as business income, you can reduce all business expenses from this. Check all the chapters out. Nitin sir, I am a central govt. employee. I want to buy a particular stock every month for next 20 years as an investment. By buying this way , is it speculation? How I have to file ITR every year and can my department/govt. may have any objection. Should I have to open a demat account. Please reply soon sir. No, if you are investing into stocks, it is not speculation. You need to use ITR2. There shouldn’t be any issues, unless your department has restrictions on investing. I have a full fledged business and filing returns under section 44AD since my turnover is less than 2 crores. I also have long term investments in equities in my personal name. I am planning to start trading in F&O in my personal name. Will trading in F&O affect my long term holdings in the sense that will my long term holdings come under the scanner and might be at risk of being declassified as long term holdings ? My assumption is that even if I am trading in F&O (or for that matter in intraday), my long term holdings will always remain as long term holdings. I plan to declare any income from F&O or intraday as business income. If there is any possibility that my long term holdings will come under the scanner after I start F&O or intraday, then I am thinking of doing F&O and intraday trading under a new HUF entity of which I will be karta. But from what I have read here, as long as you properly classify your F&O and intraday income as business income, you can be a trader and investor as the SAME time. So there is no risk to your long term holdings being reclassified also as business income. Trading F&O won’t affect your long term holdings. They are both separate activities. Thanks for that wonderful tutorial. Last 3 years i got losses around 3.75 lakhs (this year 50k) in fno. My net salary is more than 5lakhs. Can use any of my losses to exempt from the tax. I never declared losses in tax filling. If i buy idfc tax advantage mf, can i show it for tax exemption if yes what is the maximum amount i can invest in this. What is the minimum lock in period? I didn’t see any lock in period while purchasing in coin so how will this work? Can you please help me in understanding this. If you haven’t filed your losses within time, you can’t carry that forward. Also trading losses can’t be setoff against your salary. Only against your other business income. Yea, tax saving funds can be invested into. 3 years lockin. Upto 1.5lks you get exemption. My salary is 9lpa. This year my intraday trading(F &O ,equity,commodities) is at net loss of 1 lakh. So if i declare the loss , will my taxable income will become 8lakh? You can’t netoff trading losses with salary. You can set it off against other business income. Is it completely legal/safe and possible to take opposite positions in NSE and BSE at the same time in Intraday Equity trading using Zerodha? Eg: If I am expecting a fall or rise in price for Stock A (Intraday Equity)but not sure about the direction, I buy 200 shares of Stock A in NSE and at the same time I sell 200 shares of Stock A in BSE. Is this kind of orders Legal? Will these orders dont get negated since both are different exchanges? If so can I place both orders using Bracket Order(BO) or Cover Order(CO) in Zerodha?. Kindly answer. You can place such orders only for intraday. It is legal. Check this. I have occurred a loss of 65000 in indraday trading for this financial year, can I declare it while computing my tax for this year as loss, and can I show my other income of 2,0000 which is taxable minus 65000 = 135000 as taxable income. Please answer. Pradeep, intraday is considered speculative business income. You can’t set it off against salary. Do go through all chapters, explained in detail. First of all many many congrats for starting such a visionary company “Zerodha”. You have changed the way trading is done and seen. So, many congrats for that. I am salaried person, I have around 5k profit in short term equity, -22k loss in intraday and -6k loss in F&O. (iii) turnover include turnover of short term equity + F&O + intraday or it is individual turnover and if we fulfil the condition of > 1cr or < 1 cr + < 8% profit, then we have to get three forms audited from CA. (iv) Could I use ITR1 while filing ITR or I have to use ITR3 only. 2. Yes, you have to 15% on STCG. 3. If you are showing as STCG, then no need to calculate this activity for turnover. Yes for F&O and intraday, you have to follow the condition. It is now 6%. 4. ITR3 since you have intrday and F&O. Profit of 3000 on F&O. This means I have to pay tax on 2000. Do I need to declare -1000 and +3000 both while filing my ITR. Can I find out from Q, If I require auditing or not? I am just learning and doing small transactions. No, you can’t setoff equity or capital gain losses with F&O or business income. You need to pay taxes on 3000. If your turnover is extremely small, you don’t need to. Go through all chapters in this module. Thanks a lot for your reply. You are visiting my campus on Sunday, but unfortunately I will not be able to meet you as I am on vacation. Sir, Where should i start ? If i wanted a career in Indian stock markets? From Jan 2018, LTCG is 10%. Please correct that in the above article if I’m right. Can you please confirm whether classifying myself as an investor or trader is a choice for only speculative and non-speculative business income or for LTCG and STCG also? Now, can LTCG + Intraday (speculative business income) be shown as business income and since it is 25k and comes well within the 0% IT slab, i don’t have to pay any tax? It is technically applicable only from April 1st, the new LTCG rules. Will have it updated. Intraday is speculative, can’t be combined with equity delivery/F&O (which can be shown as non-speculative business income). Sir I am a govt. employee and my salary is around 4.3 lakh in FY 17-18. I am new to this trading world and have started trading on November 17. My ID is YS6854. I have done intraday and hold shares for long term. Sir I didn’t come under tax in my salary account. But I have few questions in my mind. 1. Can I have to fill the form for trading activity since it is less than 6 months. If yes than which form do I need. 2. I have booked more losses than profit in intraday should I have to mentioned it in the form. 3. From where did I will get my intraday data of trading. 4. I am confused in declaring myself trader or a investor under Speculative Business income or Non Speculative Business income. It is not safe to mention ID in a public place like this. 1. ITR3 form, and you have to file this before due dates which are between July to September usually. 3. Didn’t get ur question. 4. Can you go through all chapters of this module. Have explained in detail. Answer to 3rd question- login into http://www.q.zerodha.com for intraday data. 1. For STCG, we can deduct brokerage charges, statutory charges, commission charges, etf fees, GST, etc. under expenses right? But cant include STT, right? 2. My father transferred the shares from his demat to mine which he had bought more than 10 years back as a gift. Now if I sell these what are the tax implications in this case? Since he bought them long back I dont know if he paid STT or not, how do i check that- he doesn’t have the contract notes or other docs and also has closed his demat a/c too. 3. Currently, my source of income is only via STCG, LTCG, interest on savings/deposits. So I have to show STCG under business income and LTCG under capital gains right? If in future or next year I find anther source of income then i can shift the STCG under capital gains head right? 2. If 10 years back, it must be on the exchange. It should be okay as long as he brought through a broker. 3. You can show STCG as STCG itself. If you are doing this like a business then yeah, show equity delivery under business. I am a VERY SENIOR CITIZEN & investing with Zerodha for over an year now. I have sincere appreciation to the Zerodha team . I have profit- STCG-386000.00 & intraday only 199.00. My turnover- 13.5 lacs & Profit is about 29%. Shall I use ITR-2 showing the entire as STCG or ITR-3? Hope no need of audit in my case. Could you please take a look at your convenience. Best to use ITR3, and yeah no need of audit. Please define frequency of trades! Is 25(pairs, one buy&sell one pair, and 25 such pairs) intraday trades/day considered as high frequency? How much is high? How much is low? Unfortunately there is no clear indication from IT department on this. You have to define and follow it. 1. I intend to show intraday as speculative business income and, delivery + Mutual Fund holdings as LTCG, as I intend to hold them for a period of more than 365 days. Am I right in doing so? 2. Also I, by accident sold off ONE & only ONE kotak delivery stock. I had intended to keep it for more than a year. Now how to show this stock and where(STCG or LTCG) ? It will be really odd if I show all delivery + MF holdings as LTCG and only one as STCG. 3. 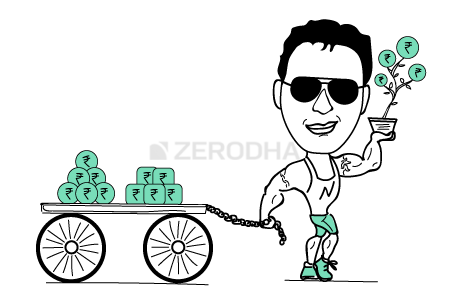 Lastly, how to calculate taxable amount (without the help of q.zerodha.com) when it comes to delivery or Mutual Funds holdings? I have the buy price of delivery but since the delivery haven’t been sold I can’t know the sell price so I cannot calculate profit or loss. Same with Mutual Fund holdings. How does one go about calculating taxable amount on a SIP with 5-year lockin period? Thank you sir for your valuable input. 2. No issues if you show one share as STCG. 3. Calculate all realized gains for more than 1 year and those less than 1 year. You have to pay taxes only on realized gains, so don’t have to declare what isn’t already sold. 1. What should my course of action be? (Sir, please answer this in two parts. Part A. Before going out of business when stock still at Rs 20. 2. What happens of my stock and money invested after the company is out of business? Is STCG and LTCG are flat 15% and 10% respectively? e.g. Can I carry forward non speculative loss and STCG loss in next year and pay taxes for 150000 in this year? Or do I have combine all the sources together i.e. 150000-90000-70000 and pay taxes accordingly? With reference to 3.2 summary table……. the intersection of row “Losses of F&O as a Trader” and column “Whether Losses can be carried forward and set-off in subsequent years —>Under any other Head” should be…….. ‘Yes’ !! This is a little grey. The conservative approach is to set-off in subsequent year only under the same head. Please ignore above ques. Please consider the following Qs…. what if after 1/2 years (in subsequent years), I get comfortable at trading and start active trading! Because my activity has changed from investing to both investing and trading, Can I not change my stance in subsequent years from being investor to being both investor & trader and declare the same while filing ITR? Yes, you can. But the idea is to not keep doing it just for saving on taxes. Thanks a lot for the answers, Sir !! Kudos to you for conceptualising the idea of Varsity! You’ve done an amazing feat of Zerodha/Varsity and You’re doing it wonderfully. Nice to go through your articles. I have been an investor for the last 3 years in equity shares and MFs. I filed ITRs2 myself successfully for all these years as an investor only. In the current FY 2018-19 i made 6 transactions in F&O for the first (and last time as well) and incurred loss of Rs 32000. The tun over of F&O is only Rs 38000. Besides this I have FD inerest income and STCGs also. My query is can I continue with ITR2 taking F&O loss as speculative Or Should I file ITR3 taking F&O loss as non-speculative. Considering small and one time activity whether Tax Audit is compulsory in this case? I dont intend to make good the loss or claim any expenses since I am not a trader. My net taxable income is Rs 200000 after section 80C deduction and first level of Rs250000 exemption limit. Please clarify. I have seen several write ups but yours are very straight and clear. Best to use ITR3 and show F&O as non-speculative on it (btw, speculative also can be shown only on ITR3). You wouldn’t need an audit as your overall turnover is quite less and you are not in the taxable bracket. Thank you Sri Nithin for the reply. I do come under tax bracket @ 5% and a little on STCGs also. Is n’t tax audit compulsory still? Can I file ITR3 without tax audit as no audit case or show 6% of F&O turn over as profit and get away without audit ? which is better? This is the crux of the issue my mind is obsessed with. Please advise. If your turnover is less, you can show 6% profit and avoid audit. But I’d say it is always best to carry forward loss, which will mean you will need an audit. Sir, can I deduct any expences incurred for STCG. Example- brokerage, stamp duty etc. Yes you can. You can show it in the cost of acquisition. But I have one more dought. In zerodha q the expences for speculative business and STCG are given combined. So can I deduct all my expences in STCG? Or I have to bifurcate expences of STCG and speculative business. And how can I bifurcate these expences? Sourav, you will have to bifurcate yourself. The new P&L from this year which we will launch in the next couple of weeks will have this bifuracated. I am a central government employee started trading in F&O segment and equity delivery. I am unaware of whether central government employee is allowed or not to do F&O. I know that speculative trading is not allowed so by definition F&O being non-speculative should be allowed. Also if it is allowed then under which ITR could it be filled? I wouldn’t know of this Amey, best to confirm with someone at your organization. ITR3. I’ve gone through the module and I am pretty sure that I will need to use ITR 3 form, however, I would request you to share your guidance as well. I am a salaried person and earned about 6L and also did intraday trades (With loss) and short term trades (With profit). Some Mutual Funds LTCG as well. Apart from that I have not been involved in F&O etc. With the amount of turnover, I am also required to do an audit. 1. I need to use ITR3 form as I have speculative loss and STCG + Salary income, right? 2. It’s very first time I am going through the procedure, can you tell me generally how much an audit costs? 3. Do you have any other suggestion for me as to how should I proceed? Going forward, I will not be involved into Intraday trades. Please help. I am so very anxious. It’s way too overwhelming for me. 2. Audit starts at around 5 to 10k. 3. Like I have mentioned earlier, since your turnover is low for intraday, maybe you can show 6% of turnover as profits (instead of loss) and avoid audit. Do speak to a CA about this. On this 6% of profits, you will need to pay some tax though. Thank you Nitin for your prompt reply. I do not know how you manage to run a forum in spite of running this business. One can learn a lot from such an attitude. I actually have one more doubt in mind. (By now, I’ve gone through the whole modules and most of the comments). 2. when filing ITR 2, I will simply put the profit of 6% for Intraday and proceed normally with the actual turnover and profit for STCG, right? These are all the doubts that we have. Once again, I really appreciate what you are doing man. Allah bless you. 1. Yes, only intraday turnover is business. Short term is capital gains and no concept of turnover in that. 2. Not ITR2, but ITR3. Speculative Business turnover can’t be shown in ITR2. Best to double check with your department if you are allowed to trade currency or not. Is it possible to have my long term investments in direct equity(shares bought and held for period greater then 1year) taxed as per LTCG rate and my short term trades(held for more then 1 day and less then a year) taxed as per the non-speculative business income rates under one PAN? If yes, could you pls. refer how? Thanks. Yeah u can. but you need to demarcate business from investment correctly. Also stick to the same stance for a few years. How can the demarcating of the portfolio’s be done. Could you pls. elaborate on this or refer to the relevant instructions. Just make sure you don’t mix up charges of each other. Keep entire transactions separate. My income is from interest. and my intraday profit is 527 and short term loss of 2882.5 on turnover of 259990. 1 which form to be used. 1. ITR 3 idEALLY, But considering very little turnover, maybe u can look at using ITR2 itself. Best to confirm with your department. I do trading in the Futures (F&O) market and have been filing ITRs under business income. For “Nature of Business”, as F&O trading is not specifically shown, I have entered code “0809-Financial Services Sector-Others”. These codes have expanded considerably from current year. Pls advise which code to use for PURE F&O TRADING activity alone. Should I use 13010, or 13014 or 13018. Or can I simply use 16019. Also in P&L, I have been showing the total of favourable transactions (i.e profits) as “SALES” under Item [1A(i)] and total of unfavourable transactions (i.e losses) as PURCHASES under item , thereby arriving at gross profits and deduct some basic expenses (telephones, internet, etc) to arrive at net profits. Check this. 13018 I think. I think you can, but about filling your ITR, best to consult a CA. When is Zerodha filing for IPO? Should we include or exclude STT while calculating Net sale amount for STCG? For Cost of acquisition we add up all costs except STT to cost of purchase of shares. So, what do in sale amount? Do the same for sell side as well, what you do buy side. One error i noticed in the updated portion (in red). So the part where you have written ”It now says that an individual can decide on his own to either show his stock investments as capital gains or as a business income (trading) irrespective of the period of holding the listed shares and securities” is incorrect. 1. non-speculative business income OR of STCG ? As here it is written that ” there is no rule which quantifies ‘frequent’ “, So i am confused. 2. Which ITR should i fill? Is audit required ? or Showing 8% of 5,143.15 as MY INCOME will be good enough? 3. Since your intraday turnover is so less, you can combine it with short term profit. No need of audit if ITR2/capital gains. is it possible to get a return of above 1lac (capital gain) within the period of 12 months? has this ever happened in the past …. if so, under what tax slab does it come? is it flat 15%(STCG)? I hold a portfolio of stocks ( some were bought more than 1 yr ago). Now if I start trading in futures, to hedge and to speculate, will it change my stock investments to business income and attract 30% or can i continue to be an “investor” and follow the 15% stcg and 10% ltcg tax rate. And how will my futures income be treated ( from hedging and from speculation). 1) so which category do i fall in STCG or speculative business income? 2) suppose the equity profits goes more than 2,50,000 rs , then do i have to pay taxes as per STCG which is 15% or speculative business income which is 10%? 2. Business income as per your tax slab. It is 5% for 2.5 to 5lks. Last year i did some intraday trading. My profits were small (in double digit only). 1) I forgot to file it in this year itr. I filled itr-1 as last time. What should i do now? 2) if i fill the itr again, should i fill itr-4 with presumptive income criteria. 3) btst trades gains are speculative incomes or short term gains? Thank you. Pls reply asap. I am worried. 1. Yeah, you can revise your ITR. 2. If it is extremely small you can maybe show this capital gains and use ITR2. Otherwise ITR3. 3. Debatable, but you can maybe show it as short term capital gain. I am confused here on this STCG vs business income. The confusion is about the trading being FREQUENT as mentioned in the chapter. So my question is that if lets say i bought shares worth 30000₹ and sold them a week later for (lets say) 35000₹. And every week i am buying shares and selling them weekly anf if i am doing this constantly for 30-45 weeks of a years(meaning i am trading almost every week of the year). So will then my profits come under STCG or business income? Because i am not able to understand this FREQUENCY thing here. How much frequency in numbers make difference in STCG and Business income? Please answer otherwise won’t be able to understand next chapters. Like I said, this is a grey area. There are many who show this as STCG and many who show as business income – both are okay, you can decide on the option after talking to your CA. But if this kind of trading is your primary income, you should I think show this as business income. Dear sir i am doing swing trading where I can get delivery of stock and hold it for 7-20 days and then sell it after stock price moves upwards to 5%. And I am do it 20 times in a month or I buy and sell 20 times a stock. So in the case above I have to pay STCG or show it as non-speculative business income while filling my taxes. As I am doing 20-30 transactions a month and take delivery and sell after 7 days in this case I am invester or trader…kindly help me. Thanks. Hmm.. I’d say a trader. It is best to show as non-speculative business income. If my income from salary and from trading or investing is less then 2.5 lakh can i have to pay any tax? Or If my inome is less then 2.5 lakh mark can i have to pay STCG tax. No taxes if less than 2.5lks. Even STCG is to be paid at only 5% if your total income between 2.5 to 5lks. Do individual trader/investor needs to get a GST No.? Or he only needs to file income tax returns? i trade in usdinr F&O. it will be treated as speculative income or considered non-speculative business. 1) ” As per section 43(5) of the Income Tax Act, 1961, profits earned by trading equity or stocks for intraday or non-delivery is categorized under speculative business income. Currency trading is also considered as speculative since there is no STT (unless you are using currency derivatives to hedge). Currency trading is speculative as there is no STT unless you are using it to hedge. I will have it changed. For equity derivatives, it is considered non-speculative. Sorry but i was unable to understand why should one declare his losses? If you trade and don’t declare, you can get questioned. Hence either profits or losses, best to declare. rather than Short term Capital Gains? hmmm.. I have explained in the post above. I was looking at the budget coverage today and some people were saying that 80C should be increased from 1.5 lks to 3lks, what is 80C? Thanks for the brilliant material published here. But the data in here is not updated, as with respect to “LTCG tax” has been brought into consideration last year so please make the changes. Hmm.. which bit isn’t updated? The 10% above Rs1lks? It is right.. I am a central govt employee. I am not allowed to do speculation or business activity meaning future trade. But can my wife do future trade with her name on demat account? Can I give gift or donation for doing that? If yes, then the bank account should be her personal or joint account is allowed? Plz answer my question sir. Happy to note that, Akash! Yeah, I don’t think there is any issues with your wife doing it. You can gift money to her, but best to do it to her personal account than a joint account. My is husband is govt employee,can I have speculative earnings in share market. Yeah, I don’t think it is an issue. Q1. I have income from interest on FDs and savings besides the above trading profits, so I will need to file ITR 3 only ( i also have LTCG from another brokerage of 20000/- this year ) ? Q2. Besides the above intraday/speculative turnover, my short-term sell side turn over is 41,51,990/-, so do i need to be audited? Q3. What documents do I need to keep on record for trading activities in case IT dept calls me in the future, cuz your website states that contract notes are available only for past 3 months? Q3. What is the last date for 2018-2019 filing, is it 31st of July 2019 or Sept? Zerodha provides all the support and help like no other brokerage and I am very happy to be your client. 2. Short term sell side turnover is only if you are showing that as business income and not as capital gains. If you are showing it as STCG, you don’t have to consider it as turnover. 3. Contract notes are sent on email to you, it can be downloaded from console anytime (no time restrictions). Other than that bank statements and trading ledger and P&L. 4. You don’t have audit, so 31st July. Also am I eligible for a rebate from any of the service taxes that have been paid like STT since my total income is below 2 lakhs ? ” No employee of the Company shall speculate either himself or through any benamdar, nor shall he permit his spouse to do so. a) ClassI and ClassII employees If the total transactions in shares, debentures, securities or mutual funds scheme etc. exceeds Rs.1,00,000/- during the calendar year. b) Class III and Class IV employees If the total transactions in shares, securities, debentures or mutual funds scheme etc. exceeds Rs.50,000/during the calendar year. 1. Am I allowed to invest in stock market / shares for long term ? 2. Am I allowed to invest in ETF stocks for long terms ? I guess you can, just don’t trade (buy/sell) frequently. If I buy same ETF stock in delivery position for each month , will it be considered as a speculative deal or as an investment ? You can if you show your equity delivery as a non-speculative business. Do go through all chapters.